Aside from an overcrowded outfield, most of the lineup the Kansas City Royals will put on the field during the 2017 season is more or less set in stone. The lone exception to that is second base, which remains very much unsettled early in spring. That position was a revolving door last season, and it’s possible the Royals will be in a similar position this season, although manager Ned Yost is hopeful that things will sort themselves out during spring training, giving Kansas City a reliable every-day second baseman in 2017. There are as many as four candidates vying for playing time up the middle alongside shortstop Alcides Escobar. 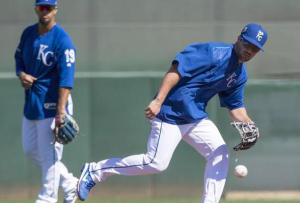 The quartet of Christian Colon, Whit Merrifield, Raul Mondesi, and Cheslor Cuthbert are all in the mix, and all four have their sights set on winning the full-time job during spring training. Of course, Colon feels the same way. “I definitely want to compete for that job and give it all I’ve got,” said the former 4th overall pick. In terms of age, Colon and Merrifield may be considered the favorites. They are 27 and 28, respectively, so they should be moving into the prime of their careers. If they can’t lock down an every day job in the majors now, they may never be able to. Of course, both have had opportunities in the past and have failed to take full advantage of them. Colon made a strong first impression during a cameo in 2014, but he’s failed to produce since then, hitting just .231 with a .586 OPS last year. Merrifield, meanwhile, stalled in the upper minors for a few years before finally get his first chance in the big leagues in 2016. In the big leagues last season, Merrifiled hit 283 with a .716 OPS, perhaps putting him a little ahead of Colon in the pecking order. If neither veteran can take hold of the job, it could open the door for the 21-year old Mondesi to emerge as the starter. After making his major league debut during the World Series in 2015, Mondesi spent most of last year in the minors, struggling offensively in his 47 games with the Royals. Kansas City would likely prefer to give him more seasoning in the minors before possibly replacing Escobar at shortstop in 2018. However, they won’t be afraid to hand him the second base job if he’s the best candidate. Finally, Cuthbert is a wild card in the second base competition. He brings a lot more pop offensively after hitting .274 with 12 home runs and 28 doubles in 128 games last season. The caveat is that Cuthbert is not a second baseman by trade. He’s never started a game at second base in the majors and has just three starts there in the minors. But with Mike Moustakas entrenched at third base, the Royals need to find a way to get his bat in the lineup, and second base may be the spot if he can handle the position defensively. So what exactly are the Royals looking for in their second baseman? Of the four candidates, the Royals may not be able to find someone who fits that description perfectly, making it difficult to handicap the race this early in spring. If it matters, Colon and Cuthbert are out of minor league options, so they are likely to be on the team unless the Royals want to expose them to waivers. There’s every chance the Royals end up having multiple players handle the position, much like they did last season, even if that’s not the ideal solution. But whatever happens, Yost is confident the situation will sort itself out.